It was early 2000, and Charlie Strong had a problem. Strong, then in his second season as the defensive coordinator for South Carolina, had gone to Columbia, SC to join head coach Lou Holtz in an attempt to resurrect the school’s moribund program. Unfortunately, instead of resurrecting anything whatsoever, the team finished an abysmal 0-11 in the pair’s first year. Fortunately for Strong, in football, the need for solutions to unique problems often leads to new ideas. In his first year with the Gamecocks, Strong’s defense had little luck defending talented SEC squads solely with traditional defensive alignments. In an effort to combat his superior foes, Strong, whose work at South Carolina and later Florida propelled him to his current role as Louisville’s head coach, went about trying to find a strategy that was novel, adaptable, and, above all else, would actually work. What he came up with was the 3-3-5 or “30 stack” defense — a defense still in vogue around college football, and one that stood as an important predecessor to the NFL’s use of versatile and athletic “hybrid” defenders who have become increasingly valuable despite not being built for traditional roles. The 3-3-5 defense starts with three down linemen, three true linebackers stacked behind those linemen, and five defensive backs. Those five include three in the traditional mold and two hybrid strong safeties/outside linebackers that can patrol the flats, blitz, stop the run or even cover receivers or tight ends in man coverage. This is just one of several ways the 3-3-5 contrasted with more traditional defensive sets, like the 4-3 (four down linemen and three linebackers) or 3-4 (three down linemen and three linebackers). The result was that in 2000, with its revamped defense (along with a new shotgun spread offense to go with it), South Carolina went 8-4 — including 5-3 in the SEC — and defeated Ohio State in the Outback Bowl. Although the 3-3-5 seemed like a wholly new strategy, it didn’t just occur to Charlie Strong out of the blue. The scheme was a natural variant from a defense he coached in another venue under Holtz: Bob Davie’s 3-4 defenses at Notre Dame. Strong came to South Bend as a position coach under Holtz, but he also coached under Bob Davie, who was the Irish’s defensive coordinator and, after Holtz’s departure, their head coach. Although no one will confuse Davie with Bear Bryant or Paul Brown on a list of coaching legends, he did coach some great defenses. Unfortunately for him, many were before he became Notre Dame’s head coach. Strong learned a number of lessons from Davie’s disruptive 3-4, and he adapted them to his 3-3-5 at South Carolina. For Strong, the 3-3-5 was just Bob Davie’s disrupting 3-4 mixed with some of the newest and best of the NFL’s defenses — essentially an all-the-time nickel package. The defense was designed for a team that didn’t have the personnel to use an extra defensive lineman and would benefit from stacking its linebackers in order to protect them from potential blockers. At the time, all of college football — and, really, every level of football — was in the middle of the grand upheaval that was the spread offense. The trend was speed, and there was no sign of abatement. Gone were the conservative matches of brute strength; change had come, and it needed to be met with more of it. There are different styles of 3-3, and Strong’s was of the attacking variety. On just about every snap, his linemen were instructed to attack a gap — the space between offensive linemen — and get into the backfield to make things generally unpleasant for offenses. This is an important difference between the 3-3-5 and the 3-4. The traditional 3-4 is a two-gap defense, which means that the defensive linemen typically line up “heads up” on the offensive linemen and are responsible for the gaps to either side. This leaves the linebackers free to roam. In the 3-3-5, there are more stunts, and usually at least one linebacker is rushing. This means each player ends up responsible for one specific gap, though the player’s specific responsibility will change from play to play. The 3-3-5 is designed to make both pass protection and run schemes (particularly zone-blocking schemes that heavily rely on double-team blocks) difficult to the point of futility. The linebackers have varying assignments, from blitz to coverage, but they are still responsible for gaps. One important benefit of this type of defense is that it simplifies assignments for players: attack your gap and make a play. The problem is that it also puts a lot on the coaches to get the calls right. “Aggressive” might be a nice buzzword that implies a roving, attacking defense, but if that’s all it means, the team running it is going to lose a lot of games. It must be done intelligently. 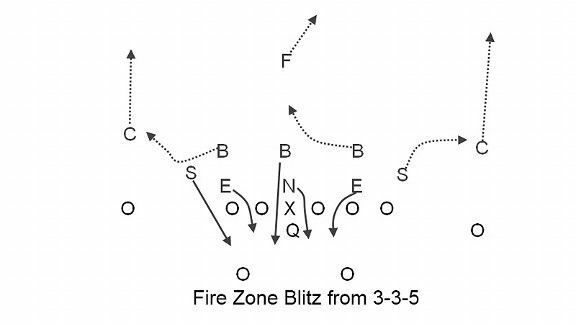 The attacking 3-3 utilizes a kind of intelligent chaos principle: players are told to attack gaps, stunt, blitz, and “fly around and play football,” but each call has a reason. Every blitz, after taking account of the players’ assignments and movements, should put the defense in a tried-and-true front designed to stop specific offensive concepts. So if a 3-3-5 coach calls an overload blitz to one side or tells the defensive line to slant one way or the other, it’s because the staff has crunched the numbers. They know, for example, that out of this specific formation, the offense runs to that direction 87.6 percent of the time. Put another way, this isn’t about aggressiveness at all; it’s about creating new defensive fronts in a way that sets a trap for the offense. Under Dunn, the 3-3-5 opened with a splash. Just two years removed from being a graduate assistant, Dunn was Memphis’s defensive coordinator in the fall of 1991 when the team was set to play Southern Cal. Dunn knew he didn’t have enough players with the brute strength to line up in a traditional front and compete against the Trojans. The solution involved Dunn swapping out one of his linemen from team’s 4-3-4 set and replacing him with a defensive back. With that, the 3-3-5 was born. Dunn shifted the alignments around — moving the the defensive linemen to the spots now custom for the 3-3-5, with a nose tackle over the center. The move worked: on September 2, 1991, Memphis upset Southern Cal 21-10. Within a few years, Dunn was an SEC coach, and after three seasons at Ole Miss and one at Arkansas, he landed on Jackie Sherrill’s staff at Mississippi State. At State, Dunn’s defenses were, at least for a time, among the best in the country. They recruited for speed (often from the junior college ranks), and according to nearly every coach around, Dunn’s defenses were among one of the toughest to deal with, in no small part because of their (and his) confusing nature. As current Nebraska coach Bo Pellini would later say, “It’s unusual; we really don’t know what they’re going to do,” adding, “There is a lot to prepare for.” While in Starkville, Dunn never feared going whole hog with the 3-3-5: almost every game, each player blitzed at least once — and typically, much more often. Dunn didn’t hesitate to put defenders in press coverage, and he’d sometimes overload one side with seven or eight defenders. As with the 3-4, the 3-3-5 defense can make free use of zone blitzes without having to drop a defensive lineman into coverage. This, along with the amount of speed on the field, means there are more guys who can blitz, fill gaps, and have opportunities to just cause mayhem. Even with his success, Dunn’s career can also be a warning about the 3-3-5. He’s held down jobs with good schools, but he never was able to break out beyond schools like Memphis, Mississippi State, and Ole Miss. While at their best, his defenses were suffocating and hard to plan for; when the talent dropped off, the aggressiveness once viewed as a virtue seemed to bleed over into a lack of discipline and a penchant for giving up big plays. Since then, he has coached at Ridgeway High School, New Mexico State, and now Division III McMurry. In football, pragmatism rules, and inflexibility — even if it’s with a great idea — leads to the rest of the landscape passing you by. His legacy is nevertheless secure. Dunn is essentially the father of the 3-3-5, and the coaches that now use it, even if only in certain situations, are his descendants. The original “30 stack” 3-3-5 is no longer the defense of the future. As with most schemes, age has exposed many of its weaknesses, and many of its leading practitioners, like Charlie Strong, have moved on to other fronts and use it as only a subpackage. But in the age of pass-first and spread offenses, the principles underlying it — movement, disguise, aggressiveness, and an extreme focus on speed — are more important than ever. From the book The Essential Smart Football, republished with permission from the author.